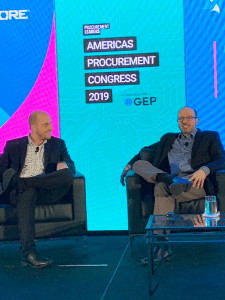 I’ve just returned from the 2019 Americas Procurement Congress, where I had the pleasure of interviewing Procore Technologies Director of Procurement, Michael Denari. Two years ago, Michael embarked on a 4-year plan to fundamentally change his procurement organization. Now at the halfway mark, his plan to create value above and beyond savings is yielding consistent results. In this post, I’ll cover a few highlights from our conversation and pass along four critical lessons that Michael learned along the way. In our interview, Michael recounted how he re-defined the role of his department with full support from finance. When transforming procurement from a department that’s expected to ‘rubber stamp’ deals to a forward-thinking organization, leaders can be reluctant to involve the Procurement, especially at the early stages. But for the sake of establishing long-term relationships, it’s important to involve every department in critical decisions. When working with finance, start with a conservative estimate of your expected savings. As you build the technical infrastructure needed to support your growth, you’ll show measurable results. But until those early numbers come in, it may be hard to set realistic goals. When a business grows fast, past results can be a poor benchmark. In that case, it may make more sense to use OKRs instead of savings as the leading performance indicator. After establishing a clear structure for his team, Michael constantly redefines objectives and redistributes responsibilities as the team grows. Conventional procurement organizations often complain that other departments only engage them at the final stages of a negotiation with a new supplier or a contract renewal. But Michael wasn’t interested in leading an organization that existed to rubber-stamp deals at the eleventh hour. He encourages his team to add value above and beyond the confines of their job description. That involves thinking proactively so they can come to a meeting having thought about questions the stakeholder hadn’t considered. It can be hard to move quickly without abandoning the systems that ensure compliance. With his mantra of working closely with other departments, Michael gradually gained the trust of the finance department. Now other parts of the company are much more likely to invite his organization into early discussions. Procore has built, bought or inherited a variety of IT systems over many years. They used Coupa for PO’s and invoices, Monday.com for projects, and Suplari for managing spend and contractual information. There was a Procure-to-Pay (P2P) system in place, but it wasn’t normalized, so the expense data in Concur was difficult to match to the data in their ERP. Michael knew he had to regain control over a growing mountain of data from disparate systems. It would have been easy to have a vendor manually sort through the data, but Michael wanted a more automated approach. His research lead him to Suplari’s solution. Now that data quality is no longer a concern, Procore’s procurement organization can focus on providing provide strategic value to the business. If you’re interested in how Suplari can help you transform your own procurement organization, get in touch with us. © 2019 SUPLARI All Rights Reserved.